A facelift is a surgical procedure which aims to address lax or drooping facial and neck tissue by standard discrete access incisions (in the temple hair-bearing scalp, in front of and behind the ear and backwards into the hairline) to allow firstly the underlying muscle layer to be lifted then the skin to be smoothly draped and tightened. The primary aim is to achieve an improved and more youthful appearance. There are varying techniques which address different aspects of facial rejuvenation – and this is discussed below. Typically a full facelift will also address the neck – see below for more information. The best candidate is one whose face and neck has begun to sag, but whose skin still has some elasticity and whose bone structure is strong and well defined. Most patients are in their 40’s to 60’s, but facelifts can be done successfully on people in their 70’s or 80’s. Ideally, it should not be too obvious that a patient has had a facelift, but instead they look younger, more vital and refreshed. It is a procedure that technically works well but also can increase morale and be well-appreciated by the patient. Some testimonials from previous patients can be seen in the drop down menu. Cost information can be seen by clicking on the ‘Prices’ tab above. Common reasons for a facelift? Mr Blackburn also has experience in performing more complex revision facelifts for patients treated elsewhere (ranging from cosmetic tourism to Harley Street London) who have been left with a partial / incomplete result. Mr Blackburn uses validated patient reported quality of life questionnaires to enable ongoing study of patients’ outcomes. It is interesting that many patients report improved confidence, socialisation, mood, quality of life and overall health / wellbeing by ~3 months after surgery. Of course, it should be said that positive testimonials from the majority of patients is not a guarntee such an outcome for future individual patients. What should you do before the operation? If you are overweight and intend to lose it you should do so before the operation. This allows the surgeon to remove more skin and therefore achieve a more pleasing result. You should avoid taking tablets containing aspirin and non-steroidal anti-inflammatory drugs such as Voltarol (sodium diclofenac), Nurofen (ibuprofen) for at least two weeks before surgery as they increase the risk of bleeding. You can, of course, discuss this with the doctor who usually prescribes them – this may be your general medical practitioner or a cardiologist. You should stop smoking at least three weeks before surgery as this is the main cause of reduced healing. It decreases circulation of the skin flaps, particularly behind the ears. Have your hair permed and tinted, if you wish, before your operation as fresh scars are sensitive to these chemicals for a few weeks. Incisions are made above the hair line at the temples and extend in a discrete line down the front of the ear, or just along the edge of the cartilage at the front of the ear, and continue around behind the earlobe and up in the crease behind the ear and backwards into the lower hair-bearing scalp. Occasionally, it may be necessary to make a small incision under the chin. A facelift is carried out in a hospital and most techniques require a general anaesthetic. It is possible to carry out modifications of the procedure – e.g. the mini-facelift – under local anaesthetic and intravenous sedation but the patient would still be advised to spend ~1 night in the hospital unless rigorous local supervision arrangements are in place with a competent 24 hour chaperone and pre-approved with both the surgeon and hospital. The procedure, although long (2.5-3.5 hours), can be combined with other operations of all sorts. The neck can be further refined / tightened by a small incision under the chin, then some fat removal followed by joining together the platsyma muscles in the midline of the neck (technically known as a submental lipectomy and platysmal plication) and this can add a further ~ 1 hour to the procedure. Other common procedures sometimes performed together would be a brow lift and an eyelid reduction with or without a chemical peel. According to the individual case, other possible procedures performed with a facelift are malar (cheek bone) and chin augmentation and lip enhancement. This is obviously to maximise the benefit of one general anaesthetic and condense the period of ‘down-time’ or recovery time outside of your social and professional network. After your surgery there is usually some bruising of the cheeks and with gravity this tends to descend towards the neck / chest over time and changes colour as it resolves. Discomfort is usually mild and can be controlled with Paracetamol. It is normal for there to be some numbness of the skin of the cheeks and ears. This will usually disappear in a few weeks or months. Anyone undergoing facelift surgery must appreciate that it carries the small risk of weakness of muscles in the face which, if it occurs, is usually temporary but may be permanent. Part of the reason for the growing popularity of the procedure is that such complications are thankfully uncommon and the modern techniques are more predictable. It is better to keep the head elevated for a couple of days to reduce swelling. Avoid strenuous activity, saunas and massage for at least two weeks. At the beginning your face will look a little puffy and may feel rather strange and stiff. Scar formation at the line of incision is a normal outcome of facelift surgery. The scars can be very well hidden by women with their hair and disc shaped earrings so that they should be able to resume work and social activities within a couple of weeks. Camouflage make-up can be helpful in masking bruising and the skin will be stable enough for make-up 7-10 days after surgery. Only make-up which is non-perfumed should be used – and which you have used/tested before without any adverse skin reaction. To conceal pink scars in the initial healing phase, a green pigment base powdered make-up can be used with skin tone foundation as the next layer. Men find it more difficult to disguise the scars which can look pink for weeks – months and will need to shave their beard somewhat closer to the ear in front and also behind the ear where the skin has been lifted. Pink scars become pale again over 4-12 months but this process can be accelerated by the use of green light lasers to close the extra capillary vessels in the fresh scar wound – ask your surgeon if they offer this service / where it can be provided before proceeding with surgery if pink scars may concern you. The scars in the hair do not usually show except that the hair is cut shorter immediately around the wound. To keep the normal position of the hairline as the skin is lifted, it can be most cosmetic to have an additional scar immediately along the temporal hairline – it is helpful to discuss with your surgeon if you prefer a higher hairline position after surgery rather than this additional scar. On the whole, scars are not “mature” and continue improving for at least one year after surgery. Sometimes scars may have to be revised if they are thick or visible. In a few patients with poorly elastic skin it may be necessary to tighten the face after six months or so. 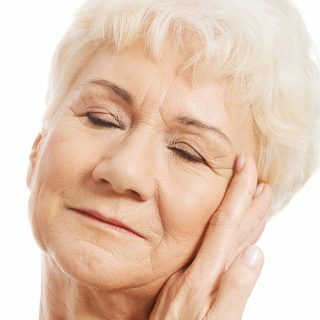 What are the potential complications with a facelift procedure? Asymmetry: most patients have some facial asymmetry and most of these cannot be corrected by face-lifting – a perfectly symmetrical result can never be guaranteed in any operation performed on both sides of the body. Any concerns about asymmetry should be discussed with your surgeon. A facelift does not stop the clock, but it does put the clock back. The effect of the facelift is likely to always be there, in that you should not look as old as you would have done if it had not been carried out. You continue to age every year and some patients go on to choose to have another facelift about 10 years later. Thus, allowing subtle shifts in rejuvenation such that continue to look more youthful than your true age (rather than having major shifts in appearance). A facelift is a skilled procedure and it is wise to choose a surgeon who has undergone a full training programme which includes facial cosmetic surgery. These surgeons will be on the Specialist Register at the General Medical Council and may be a specialist Facial Surgeon (Maxillo- Facial) – a specialist in facial surgery (both hard and soft tissue; reconstructive and cosmetic), Otolaryngology Head & Neck Surgeon (‘ENT’) – operating on the ears, nose, throat, sinuses or face – or a general Plastic Surgeon – operating on the abdomen, breasts, legs, arms, groin and faces. All members of the Association of Facial Plastic Surgery (AFPS) in the UK and the British Association of Aesthetic Plastic Surgeons (BAAPS) are on the GMC Specialist Register and have a special interest in cosmetic surgery. It is important to consider not only your surgeon’s qualifications and training, but also – ask what anatomy they spend most of their week operating on! It is arguably a productive consultation if your surgeon ultimately directs you to another specialist whom they know to be sub-specialised in your area of concern e.g. a general plastic surgeon may choose to refer you to a facial cosmetic surgery specialist. Call Mr. Blackburn on 01925 215 008 or email stephanie.cartwright@spirehealthcare.com. 30 minutes: £215. Written information about procedure and aftercare, letter to patient / GP. Preoperative assessment with nurse and doctor support. Cosmetic Surgery with ward care, removal of stitches + postoperative review consultations with Mr. Blackburn all included in the cost of surgery. My friends and family say I look brilliant. The treatment and surgery I had was excellent. I look younger and am more confident. The expertise of the surgeon [Mr Blackburn] is truly amazing. The care of all the staff was outstanding. I wanted good care - I got excellent care. Friends and family say I look very fresh looking, amazing! Meeting the Consultant and Anaesthetist before the operation was very reassuring. A great experience. The procedure was long, meticulous - successful outcome. Felt reassured on the treatment that I wanted. Amazing support afterwards. Feeling good and refreshed. Happy. I look 10 years younger, even my bus pass was questioned! [Mr Blackburn is a] great guy, easy to talk to and a good listener. My family are amazed. People have commented that I look different but didn’t know why. My husband can’t stop looking at me and calling me a beautiful wife! Mr Blackburn was extremely approachable and understood exactly what I wanted to achieve. All the nursing staff at Spire Cheshire were helpful and provided a high standard of care. My friends say I look younger and less wrinkled – but still look very natural. I think I look 10 years younger. I am so happy with the results and would not hesitate to recommend Mr Blackburn and Spire Cheshire hospital.